President Vladimir Putin significantly changed the script for Russian military reform on October 24 by indicating intent to end the draft in favor of volunteer contract service. The largest questions are why, and why now. The answer to both is the impending presidential election on March 18, 2018. It will be more a coronation keeping Putin formally in power for 20 of 24 years of the 21st century (but in reality for all 24). Still there’s no doubt ending conscription will provide an extra electoral boost for Putin. Cutting the draft term from two years to one gave Team Putin a lift ten years ago. Russia’s generalitet has always said the military will never completely abandon conscripts for contractees. It fears the difficulty of conducting a big-war mobilization without hundreds of thousands of relatively young men with pretty fresh basic military training. Just like that, however, Putin changed a fundamental assumption of his generals. Writing for Yezhednevnyy zhurnal, the inimitable Aleksandr Golts has pointed out the MOD’s flawed addition when it comes to contractees. Literally 11 days ago, General-Colonel Mikhail Mizintsev said the armed forces have 354,000 contractees. And Defense Minister said they had 384,000 at end of 2016, so the number is actually falling. At the end of 2017, they are supposed to have 425,000. Golts believes the number of contractees stalled at the 2015 level, with the 90,000 added since then cancelled by a similar number declining to renew their contracts after three years. So, he continues, one has to think the conditions of service in the army aren’t as attractive as depicted on MOD brochures. Contract pay hasn’t increased since 2012 (but inflation has by 44 percent). And the chance of injury or death in a “hot spot” like eastern Ukraine or Syria has gone up. Regarding the reduced requirement for conscripts in the current draft campaign, Golts puts it down to the fact that the Russian Federation is at the very bottom of its demographic trough right now. In 2017 and 2018 respectively, only 638,000 and 633,000 18-year-old men are available. As a result of all this, Golts sees Russian Armed Forces manning at about 850,000 (250,000 conscripts, 354,000 contractees, 220,000 officers, and 30,000 military school cadets). This is well below President Putin’s recently authorized 1.13 million. The missing 160,000 or so troops has to affect Russia’s combat capability, according to him. He expects the generalitet to close gaps in the ranks with reservists to create leverage to convince Putin the draft must be preserved. But maybe Putin isn’t even serious about ending the draft anyway. One must report the apparently contradictory along with the confirmatory . . . Mil.ru has reported GOMU’s final results for the spring 2013 callup. GOMU indicates that, as of 12 July, it summoned more than 700,000 draft-age males, with more than 692,000 appearing as requested. The order to induct 153,200 men in President Putin’s decree was, of course, fully accomplished. It must have been hard getting 118,000 men in front of draft commissions during the final ten days of the callup. Это какой-то штурм . . . .
Another posting hiatus officially ends. President Putin’s March decree stipulated 153,200 men would be inducted into the armed forces in the first half of 2013. 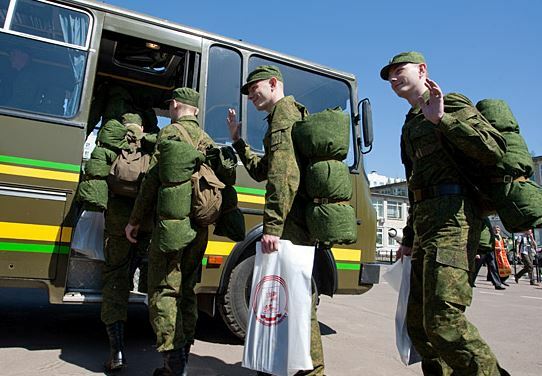 We’ve not often seen figures on the number of young Russian men receiving a summons to appear at local draft commissions during conscription campaigns. In fall 2012, 556,000 were summoned and 545,000 came against an induction target of 140,140. In fall 2008, more than 800,000 were summoned against a target of 219,000. The drop from 800,000+ to 500,000+ illustrates the abrupt break in the number of men liable to conscription which occurred between 2008 and 2013, i.e. the “demographic hole” caused by lower birthrates in the 1990s. Still, it shows consistency — it appears the Defense Ministry (if it meets its induction target) conscripts 25 percent of the men it summons to draft commissions. And the difference between summonses and appearances shows what looks like the number of draft evaders for that half year (i.e. 8,000 or 11,000). It’s interesting to compare the summons number to the number of available 18-year-old males. The data below came from the U.S. Census Bureau, but the birth year in the left column was changed to indicate the year group will turn (or turned) 18. The age column is the year group’s age in 2013. According to this, you can see the nadir of the “hole” doesn’t come until 2018 and the climb out is long and slow. The number of males born doesn’t even return to the level of 1990 (shown here as 2008) until some time after 2031. So, this spring the Defense Ministry summoned 582,800 men against 718,070 available 18-year-olds. Obviously, a significant number of those summoned are probably 19, 20, etc., and were summoned before, in 2012 or earlier. And presumably, some who will be, but aren’t yet, 18 this year can’t be summoned until the fall 2013 draft. The point being that the draft net has to be expanded considerably to bring in two groups of nearly 600,000 (even with many repeaters) to be considered for military service. And it’s clear many brought in for the second or third time have solid legal deferments. Some of them are, of course, drafted later. Witness the Defense Ministry’s fondness for citing the percentage of draftees with complete higher education. But it’s certainly harder for the military to draft an older man than it is one just turning 18 this year. Economically speaking, the marginal cost of inducting a 22- or 24-year-old is much higher. It requires greater effort on the commissariat’s part and the average return on the time invested is much lower. It’s hard to guess the mechanics of the draft, but here’s a whack. As stated above, the Defense Ministry puts 582,800 men in front of draft boards to find 153,200 it will accept. Of those 718,070 18-year-olds in 2013, presumably only half have birthdays allowing them to be drafted in the spring. So, in a perfect world, that’s 359,035 of the men needed at the draft commission. And 223,765 are still needed. The Defense Ministry looks first to this year’s 19-year-olds. There are 730,049 of them. But many served, or will have served, in 2012-2013. The draft campaigns last year inducted 155,570 and 140,140 for a total of 295,710 men. Here’s where real guesswork begins. 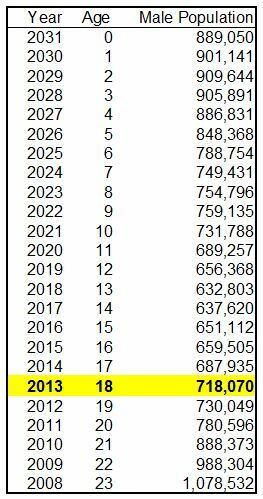 If 200,000 18-year-olds were drafted last year, there are only potentially 530,049 19-year-olds to send some of those other 223,765 summonses to this year. And if deferred, their deferments probably still hold this year. And the undrafted 19-year-olds will probably need to be summoned again in fall 2013 even though another 359,035 men will turn 18 in the second half of the year. Those 19-year-olds might be considered for induction in place of some large number of 18-year-olds already picked for the military in the spring. But you get the picture of how rapidly the military’s human resources diminish. It’s far from a complete picture, but an interesting and essential part of the Russian military manpower dilemma. Of course, the Defense Ministry has the long-term answer for its declining conscription resources: professional contract service. The trick there is to make it work. Gazeta.ru pieced together RIA Novosti clips of General Staff Chief Valeriy Gerasimov’s session with foreign military attaches yesterday. “Organizational development” is primarily (but not entirely) TO&E and force structure. Gazeta reports Gerasimov said mixed conscript and contract manning will be preserved, and the one-year conscript service term won’t be increased as some would like. Serdyukov’s Defense Ministry had various organs with this responsibility, including Rosoboronzakaz, Rosoboronpostavka, etc. How will the new structure be better? There’s a long list of policies commentators think will or might be changed, but little so far officially. A new category to replace Serdyukov’s Reforms is needed. Maybe Shoygu’s Nuanced Corrections? Continuing with Prime Minister Putin’s latest pre-election article on the army . . . Russia Today published a translated version. Describing the army’s “social dimension,” Putin says a modern army requires well-trained officers and soldiers on whom more demands can be placed. And they, in turn, deserve pay commensurate with that of specialists and managers elsewhere in the economy. Hence, the new pay system for officers this year which practically tripled their remuneration. Putin mentions that military pensions were increased 1.6 times (60 percent), and he promises they will now increase annually by not less than 2 percent over inflation. Retired or dismissed servicemen will get a “special certificate” good for further education or for retraining. He says the accounting of officers needing apartments was conducted poorly, org-shtat measures [dismissals] weren’t coordinated with the presentation of housing, and the situation has to be corrected. Putin is, of course, alluding to the fact that maybe 30,000 or 80,000 of those 140,000 apartments the Defense Ministry acquired or built remain unoccupied. But he’s not exactly tackling the problem head-on. Putin says the “eternal” permanent and service apartment problems will finally be resolved in 2013 and 2014 respectively. But in mid-December, in his “live broadcast,” Putin said his new deadlines were 2012 and 2013. So, he’s just given himself an extra year on each. Putin says the military’s mortgage savings program now has 180,000 participants, and 20,000 apartments have been acquired through it. He also notes that regions and municipalities won’t have broken down military towns and infrastructure foisted upon them. Putin gives the familiar figures–there are 220,000 officers and 186,000 sergeants and soldiers who now serve on contracts. Over five years, the army will try to recruit 50,000 professional soldiers each year. Selection, Putin says, will be strict, and contractees will be trained in special centers and sergeant schools. In the reported one-million-man Russian Armed Forces, 700,000 personnel will be professionals by 2017. Conscripts will be reduced to 145,000 by 2020. Putin says the mixed contract-conscript system of manning used for quite some time was just a compromise because Russia couldn’t afford an all-volunteer army. Putin endorses military police and priests in the ranks to keep order among remaining conscripts. He also promises those who serve as draftees assistance with education and preferences in entering the government service. The Prime Minister admits Russia lacks a concept for its national military reserve system, and developing one is a near-term task. 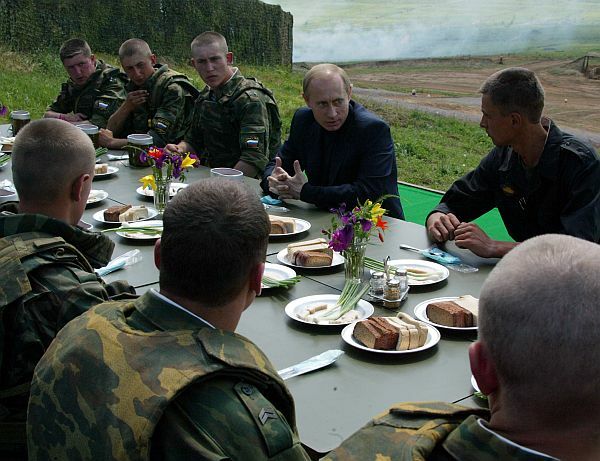 Although the course is set for a professional contract army, Putin still wants young men to prepare for service. So don’t forget about military-patriotic indoctrination, military-applied sports, and DOSAAF. And Putin indicates he supports Deputy PM Dmitriy Rogozin’s proposal for a Volunteer Movement of the National Front in Support of the Army, Navy, and OPK. Part III will be the final five pages on the OPK.